I’ve posted several empties on the Instagram but just realised that I haven’t done that regularly for the blog. 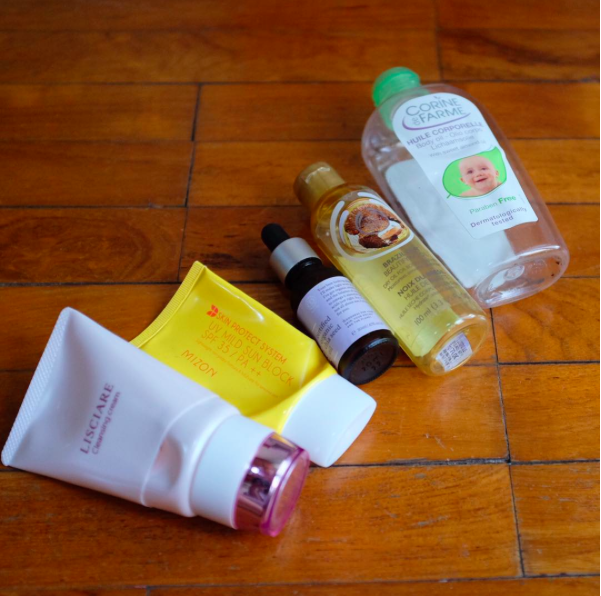 Especially considering that #missionempties was a big part of my skincare routine couple of weeks back. Another reason is because last month’s empties contain some of my HG products so they deserve their own post. First of the lot, Menard Lisciare Cleansing Cream. No need for introduction this one and the whole Lisciare range definitely a HG skincare line for me. I particularly love this cleanser because it’s cream so it feels great on my dry skin, it turns oily in no time and it has that grip and slip that I needed to cleanse my entire face. Unlike it’s younger sister Tsukika range, this cleanser removes even the most stubborn mascara at ease if you massage it thoroughly around the eyes. It’s also easier to remove it with water. This is probably my third or fourth tube and I already have one spare in stock. Considering I have started using skincare when I was in Junior Highschool, I’ve probably use skincare for more than two decades. So it’s no surprise when I said … ah, yes I’ve used such and such brand a decade ago. If you don’t see them in my routine, it doesn’t mean I don’t love them or I haven’t used them. Considering the length of time I’ve been using skincare I’ve tried so many skincare products out there and to keep up with the vast array of choice I like to keep my option open. So I try not to stick to one brand only. Here are three brands that many of their products I’ve used and I recommend them time and time again and I have brand loyalty to. It appears in the order of which I started using them. My mom introduced me to their 3-step system: cleanse, exfoliate and moisturize. Such a simple routine but it works. Their clarifying toner has been there even before the hype of exfolating/acid toner. Unfortunately, most of the clarifying toner contains alcohol with the only exception of the Mild Clarifying Toner. If you’re not ‘allergic’ to alcohol the clarifying toner in no 2 should be decent enough and with the added hyaluronic acid in its renewed version couple of years ago it’s not as drying as the original version that I used when I was teenager. Other than that, their Dramatically Different Moisturizing Lotion garner a cult following because it’s light and hydrating. But it acts more as an emulsion rather than a moisturiser. Other products such as Turnaround line, Superdefense and Moisture Surge moisturisers are too die for and worth checking. Clinique at its core is an effective skincare, no nonsense, great beauty consultant at their counters (which is rare for Indonesia) who understands their products and also at a reasonable price point for department store skincare brand. Kalau mengikuti akun Instagram saya, pasti 2 minggu belakangan ini udah bosen, ya, “dengerin” saya ngeluh masalah jerawatan. Untuk seseorang yang jarang banget jerawatan this is major! Nggak mungkin lah, kalau nggak pernah bermasalah kulitnya. Begitu pula saya. Biasanya sih kalau PMS adalah satu atau dua. Tapi kali ini, begitu hilang satu muncul satu lagi. Gede-gede pula! Sebelnya, jerawat yang timbul bukan jerawat yang ada matanya, tapi jerawat batu. Ini sebenarnya kesalahan saya sendiri, sih. Awalnya karena mudik ke Malang. Pas mudik ke Malang saya tahu betul kalau di Malang sedang dingin, around 20 degrees. Nah, di antara itu saya sempat ke Blitar, di mana udaranya tidak sama seperti Malang tapi lebih berdebu. Saya sudah siap tempur. Bawa segala macam deep cleansing mask dan juga siap sedia Sunday Riley Artemis dan History of Whoo Soon Hwan Essence karena kedua produk tersebut paling ampuh membantu menyeimbangkan kondisi kulit saya. Sayangnya, begitu balik ke Jakarta saya mulai lalai dan enak-enakan. Padahl udah di Jakarta sedang panas-panasnya. Yang terjadi adalah dua minggu kemudian mulai deh muncul satu persatu jerawat! Yang paling bikin bete adalah jerawat batu ini sakit banget dan ganggu karena gede banget. Jadinya saya jadi gatel pencet-pencet dan jadilah berbekas dan merusak jaringan kulit *sigh*. Anyway below are the skincare that I’m using in the morning to tackle this problem.